I have used essential oils for years. My aunt taught me about them. My favorite is Ylang Ylang. Puts me in a good mood automatically. My aunt will back up that fact. I have always used Eucalyptus oil in my vaporizer instead of vicks. I use Lavender to help calm and relax. I use peppermint for sore muscles or a sunburn. I use them. I love them. It is a natural way to help my family. So where did doTerra come in? Well have heard all about them and the fact that they are a pure oil caught my eye. There are a lot of oils out there but not all of them are pure. You might be asking yourself “Why do I even need essential oils when I can just go to the Doctor?” The reason is: Essential Oils are a safer, more natural approach to medicine with no side affects. Eighty percent of the time your illness is a viral infection and there is no “over the counter” medicine to combat a virus, however, Essential Oils have several studies showing there ability to kill a viral infection. 1. Lavender - It is the most versatile and popular oil. It is great for burns and takes aways pain and blistering fast! It works very well as a sleep aid and it has a very calming effect. It also works as a natural antihistamine and provides relief from insect bites. Rub on your feet each night for relaxation, or headache relief. 2. Lemon - Use a drop of lemon every day in your water to keep your body acid free (alkaline). Lemon helps clean your lymphatic system. It is excellent for sore throats– just place a drop on your tongue or gargle with lemon water. You can also use it as a cleaning agent. Lemon oil will clean ninety-nine percent of bacteria. 3. Peppermint - It has been double-blind studied against Tylenol and was proven to be just as effective in treating headaches. Peppermint Oil was reported by the Mayo Clinic as being one of the most promising treatments for I.B.S. It is fantastic for digestive issues and when inhaled it will stimulate the brain to increase alertness. 4. Melaleuca (Tea Tree Oil) – This is fantastic for acne since most acne medications are antibacterial creams, melaleuca is antibacterial. It is also great for most skin conditions: general rashes, eczema, psoriasis, fungal infections, and MRSA. You can rub it on your head to control dandruff and on your chest for coughs. 5. Deep Blue - It reduces inflammations and relieves sore muscles and back aches. Use this oil on all sport related injuries and will also relieve headaches. 6. Oregano - It is your heaviest fighter oil with several studies proving its ability to kill MRSA (staph infection). It is one of the most important oils to use when fighting any infection. It is a very hot oil and must be diluted with any carrier oil (Coconut Oil, Olive Oil, Almond Oil etc) to apply topically. 7. On Guard - This oil helps to strengthen your immune system. This is great for disinfecting the home via a diffuser or even mix with water to use as a cleaner to wipe down counters. Rub this on your feet every night for cold prevention and can rub on teeth to help reduce plaque & gum infections. 8. Breathe - Use this oil from respiratory infections,coughs, or asthma symptoms. Rub it on your chest to help combat congestion. Rub on chest and under your nostrils to help with snoring. Unlike other Vapor Rubs, Breathe will actually assist your body in fighting off the infection. 9. DigestZen - this blend will work for any digestive disorder: Acid Reflux, heartburn, H.Pylori Bacteria, diarrhea, Constipation, IBS, etc. Rub four drops of DigestZen on your stomach for all the above. Seventy percent of your immune function is through your GI so if you have a compromised GI you have a compromised immune system. Using DigestZen will help strengthen immune system. 10. Frankincense - this oil contains sesquiterpenes, enabling it to go beyond the blood-brain barrier. It may help oxygenate the pineal and pituitary glands. Many people belief it helps with anxiety and depression. Several studies have been done on Frankincense and its ability to inhibit the growth of cancer cells. Don’t take my word for it, try it for yourself! doTERRA Essential Oils work perfectly with the body to support normal functions of the body and dōTERRA products are safe to use on all ages. 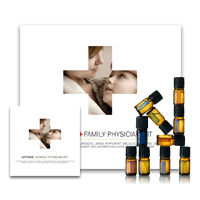 To purchase your Family Physician Kit and set up your wholesale account, click here- doTERRA Wholesale Account. Please note that by clicking the “Join as an Independent Consultant” does not require you to sell doTERRA products, it is allowing you to purchase all doTERRA products at wholesale cost.